NOTE: Hey all! I've decided to not continue the radio show--just too time consuming and the on-demand means of hearing it is no longer an option (either you heard the show live, or you were out of luck). So I've decided to get back into posting finds, via the blog. 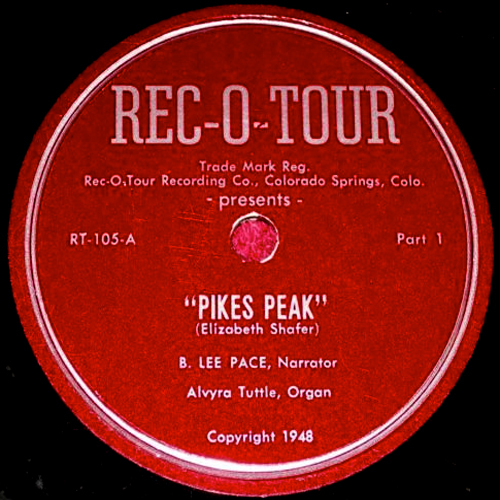 Narrated by B. Lee Pace, and accompanied by the organ of Alvyra Tuttle, I could have sworn this 1951 recording is much older, given the production. Mr. Pace was a veteran Colorado Springs newspaperman and secretary to former Governor E . C . Johnson. According to an Internet search: "He is a graduate of the University of Missouri School of Journalism and for more than 30 years was news editor of tho Colorado Springs News, a weekly farm publication. He later was a columnist and news writer for the daily Free Press in that city." 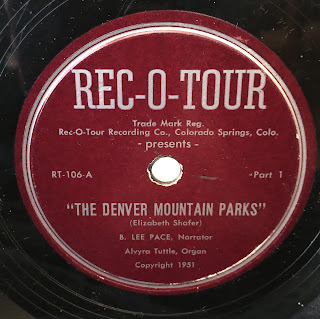 Alvyra Tuttle was apparently a local organist in the Springs. She passed away in 2004. Rec-O-Tour released a few other recordings, all written by Elizabeth Jane Shafer, who was a member of the advertising staff of the Colorado Springs News, and a continuity writer for KVOR radio. The records were shipped with "Kodachrome slides," to accompany the recording as a complete audio/visual presentation.